Thousands of silent wishes from all across the world were summed up by the pleas of one supporter in the Kop. 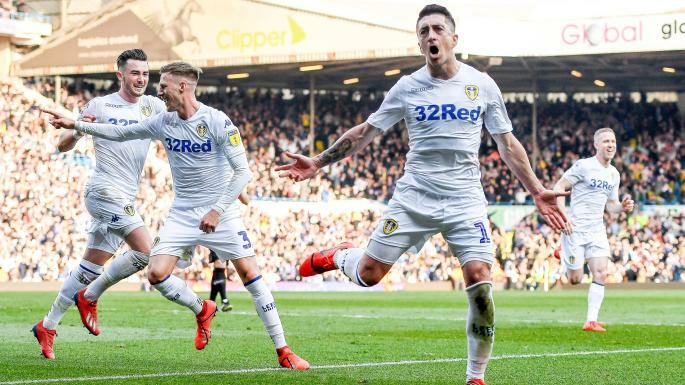 Seconds later a flying Pablo Hernandez appeared in the six-yard box, sparks of magic dust emanating from his beautiful right foot as he crashed home the winner that sent the fans into rapture. We knew what Millwall would bring. They are battling relegation. Neil Harris has a thinly-veiled contempt for Leeds. Steve Morison spent the week preceding the match taking swipes at Marcelo Bielsa, who I’m sure was devastated to have lost the approval of The Shift. Bernard Black put it best when he accosted a group of Millwall fans in a bid to attract a kicking. But we knew this already but carried away on the elation and tension of the season we are experiencing, we misplaced our memories momentarily. For about ten minutes. It only took Ben Thompson’s anything-but-dreadful tenth-minute header to bring us back to earth. The ball over the top, the tenacity to get to the byline and the headed finish could only be applauded. 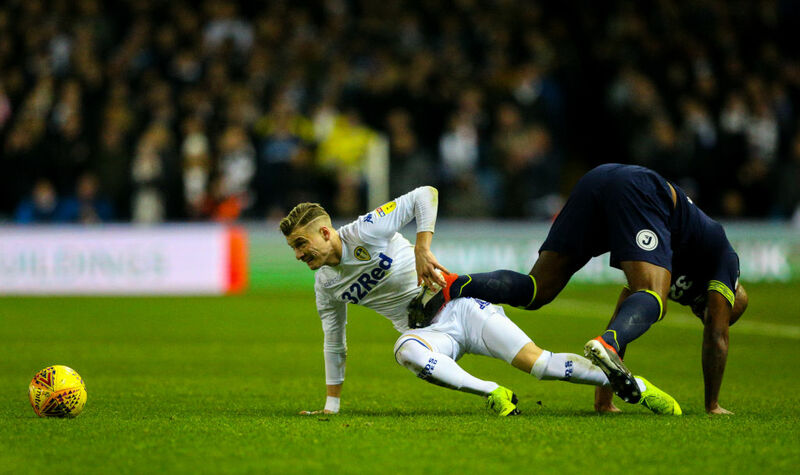 Leeds continued to be the white-shirted warriors we have adored all season and pushed forward again, earning a shot at redemption from the spot after Gjanni Alioski fell over was brought down. Dubious though the decision was, we were happy to benefit from the decision in an area that has largely gone against us all year. Paddy Bamford’s miss is why we aren’t allowed nice things like penalties. A self-confessed off-day for the Tory peer, who has no-doubt pledged to let his party’s inner Brexit-related turmoil derail his promotion strawberries and cream. By this stage, Billy Sharp had Sheffield United 1-0 up and the Blades were four clear in second spot. A despondent Leeds support shuddered at the thought of a play-off struggle and no doubt had to fend off flashbacks, but the drama was only beginning. 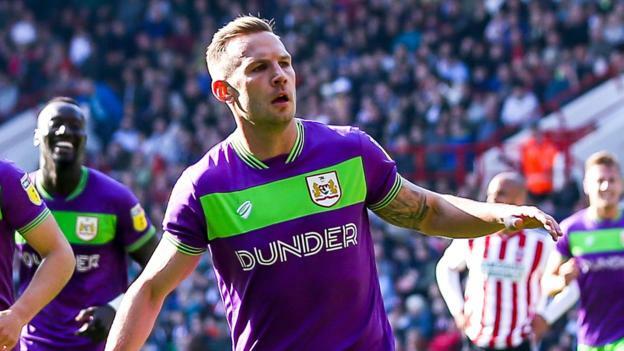 Andreas Weimann, who, had he been in Leeds on Saturday evening, would have drunk like a lord for free, had fired in an equaliser at Bramall Lane, and the Whites followed suit. The tireless Alioski started the move, a typically sweeping one that ended with an Ayling cross and textbook Hernandez finish in front of the adoring South Stand, Pablo once again pursuing his vendetta against Championship goalkeepers. The half-time lift that the goal gave Leeds lasted exactly as long as the feel-good factor at the beginning of the game, as Liam Cooper was forced into bringing down Ben Marshall with the Lions circling in the box. Marshall’s finish and subsequent goading of the South Stand drew the ire of the Leeds fans, but the home side continued to roar forward and would eventually end the game with 69% possession, 79% passing accuracy and 18 shots. Their dominance was finally crowned by Luke Ayling, Bill climbing highest in the box to head home a beautiful ball from Barry Douglas. Douglas had been put in that position by the sheer will of Harrison, who bust a gut to keep the ball in play for the Scot. As delirium erupted in LS11, over in S2 Irish international Scott Hogan was giving his side the lead and sending them comfortably into the automatic places. 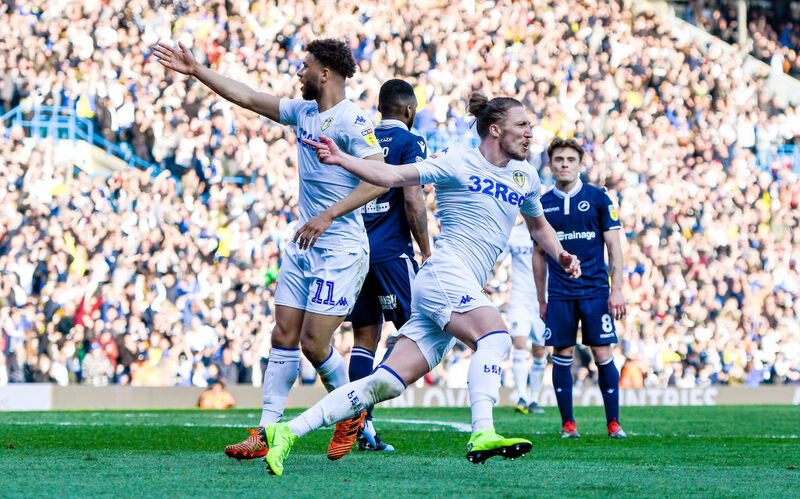 The Leeds crowd upped the decibels as they went in search of a winner to keep the pressure on, but what transpired was beyond the wildest of script-writers. Within six minutes a ripple in the crowd told all present of Weimann’s second equaliser and the swell became incessant as Leeds poured forward in numbers. Hernandez switched the ball wide to Harrison, whose sublime touch slipped in Roberts on the left. A shimmy from the Welshman and a low cross later and there were limbs throughout the stadium. Amid the revelry, with strangers embracing with shared ecstasy, in a stadium only forty miles away, a free-scoring Austrian was writing his name into this season’s folklore. Weimann’s third had blunted the Blades and raised United into second place again. The collective eleven minutes of stoppage time over both games racked up the tension to unbearable levels. Those in the stands gripped each other nervously. Listening and watching around the world, supporters paced the room, hands clasped over their mouths. Bemused wives and daughters looked on curiously, only to be unwittingly swept up as the final whistles sounded. 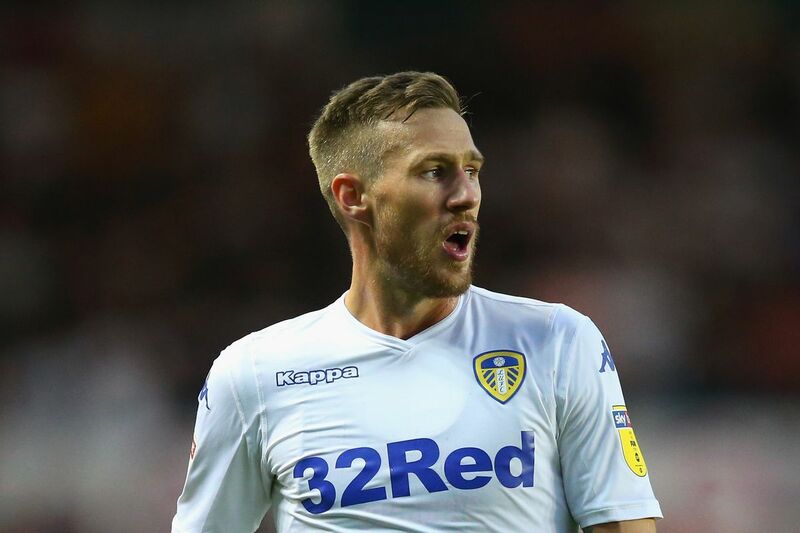 Pablo Hernandez’ one-man wizardry will undoubtedly provide the narrative to this vital victory, but the plaudits have to go to Barry Douglas. It was announced today that the full back had sustained medial ligament damage during the game, but bravely soldiered to the end, stepping up to provide that delicious assist for Luke Ayling. Douglas has not sparkled of late, but this display of fortitude proves one thing. Like Pontus, he is Leeds. I wish him all the best in his recovery. Seven to go. 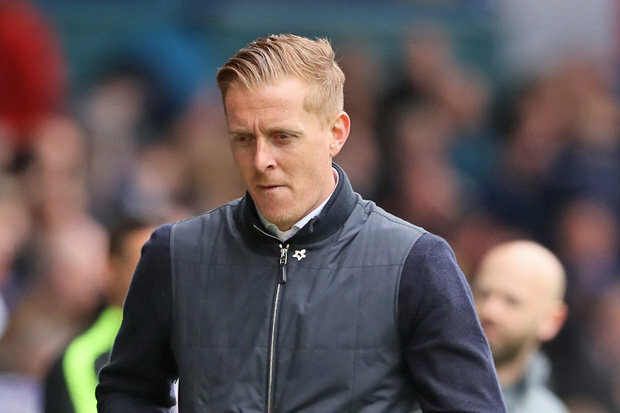 Next up, St Andrews and Garry Monk. We’ll also have an eye turned towards Carrow Road, where managerless QPR could spring an upset and towards Deepdale as Preston try to keep their play-off push alive at home to our rivals Sheffield United. With a bit of luck, we’ll not have to look at Neil Harris, Ben Marshall or the spectre of Steve Morison ever again.